peace in the world they can have it. If one billion people in the world think peace, we’ll get peace. Visualize the domino effect and just start thinking PEACE. Remember: A dream we dream together is reality. So stand up, speak out, and come together. The biggest online peace event. 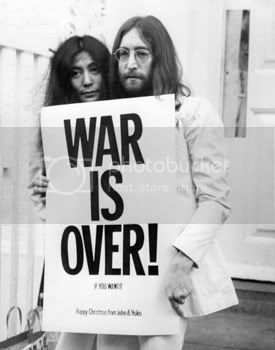 It began on October 9th 2007, John Lennon’s 67th birthday. Today is the 27th anniversary of John Lennon’s untimely death. You may also enjoy my Well We All Shine On post I made two years ago after seeing an awesome U2 concert. When we realize that we are all one of the same. Christ consciousness, and that our Intentions are creating our realities on a day to day basis, Nothing is impossible. But as you said, people just don’t know that they can do the miracles Jesus did and greater just with their Intentions. Manifest what you want, take your minds off of the negative, and wondrous new worlds will open for you.